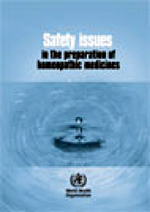 GENEVA.FEB.17 WHO has published Safety issues in the preparation of Homeopathic medicines. It contains 448 pages. This technical document is WHO's response to requests and recommendations made by relevant World Health Assembly resolutions, by Member States, as well as international conferences of drug regulatory authorities, and is a part of the implementation of the WHO Traditional Medicine Strategy and the WHO Medicines Strategy. It aims to provide guidance to Member States on technical aspects of the production and manufacture of homeopathic medicines that potentially have implications for their safety. This is of relevance for establishing national quality standards and specifications for homeopathic medicines, as well as for controlling their quality.